If you’re tired of spending your free time cleaning, or find yourself weary of unreliable cleaning companies who can offer poor quality services, Helpling Singapore team is there to help. Our home cleaning services platform is available throughout Singapore, from Pioneer to Changi, Yishun to Sentosa, and everywhere in-between. 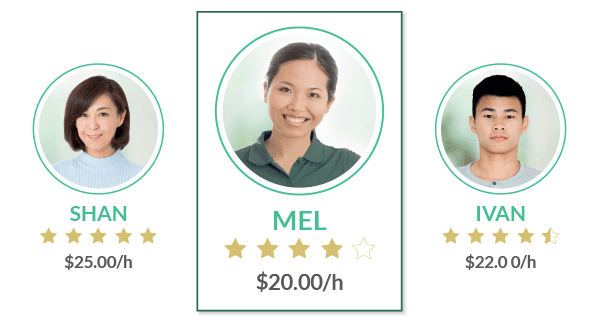 With Helpling, it is easier than ever to find part-time cleaners for your home using our simple online booking process. All you need to do to make a booking, is input your cleaning requirements and a convenient time and date, then tailor the cleaning service to suit your requirements. And Helpling will do all the rest! We’ll connect you to a local Singaporean maid or PR cleaner, who will then arrive at your home, on the agreed day, to make your house sparkle from top to bottom! Our rates are simple and transparent, from just $20 per hour for a regular weekly or fortnightly cleaning, and $30 per hour for a one-off clean. This price includes absolutely everything – no tipping, no hidden costs. How do we select Helpling cleaning partners? All of the cleaners on our online marketplace have passed a multi-stage interview process, including a cleaning knowledge test to ensure their home cleaning skills meet the standards we work to. Only Singapore citizens or permanent residents can apply to become cleaners with Helpling. They are also police background checked. So you’re safe in the knowledge that any cleaner we send is working legally in Singapore. Additionally, every part-time maid and cleaner is backed by a $1 million public liability insurance policy. We are the only service in Singapore offering such insurance, and this underpins the trust our customers place in our cleaning partners. We take the utmost care to treat Helpling cleaners with the respect they deserve. When you book through Helpling, you know you’re hiring a part-time cleaner who is paid a competitive wage, works flexible hours, and is supported by our team. This respect and positivity is reflected in the service our cleaning partners provide. We take care of our cleaning partners, and they in turn take care of your home. If you need a bit of extra help around the home, you can add extra cleaning services on top of the standard cleaning package. Let Helpling take care of the ironing, oven, closet, fridge, and spring cleaning, and the cleaning of interior windows. You can rest assured that your part-time cleaner or maid will do an professional-level job of whatever additional services you request.